The MP8101 is a Rail-to-Rail output, Operational Amplifier in a TSOT-23 package. This Amplifier provides 400KHz bandwidth while consuming an incredibly low 11,A of supply current. The MP8101 CAN operate with a single supply voltage as low as 1.8V. This is one package pinout of MP8101,If you need more pinouts please download MP8101's pdf datasheet. 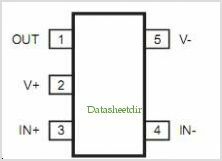 This is one application circuit of MP8101,If you need more circuits,please download MP8101's pdf datasheet.